Wilmington Mayor Mike Purzycki said tonight the state of the City is vastly improved and getting better every day. 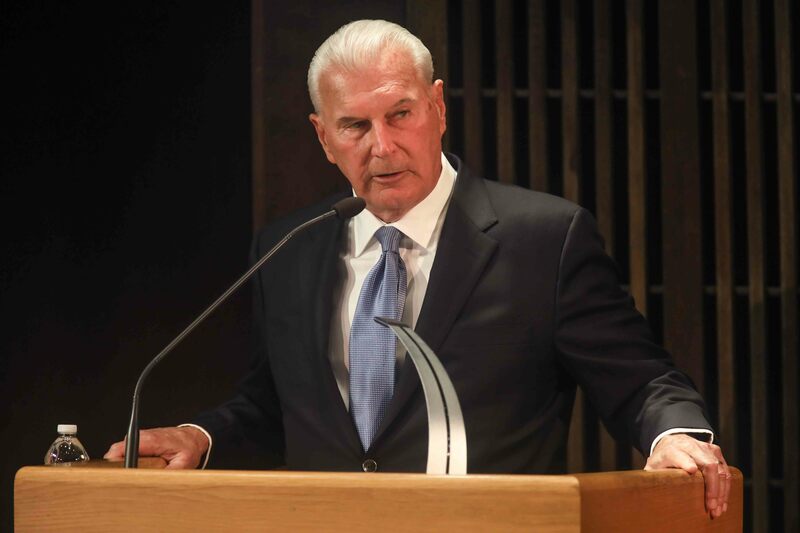 In his annual budget address to City Council, the Mayor said the Administration and Council have many accomplishments for which to be proud, and many reasons to be hopeful about the City’s future. Among those accomplishments is a more stabilized financial condition for the City based on the Mayor’s five-year financial plan that is helping Wilmington control anticipated budget deficits, replenish the City’s cash reserves and align expenditures with departmental strategic goals. Mayor Purzycki said the city is by any measure, in a far better place than it was when he and the newer members of Council took office in January of 2017. The Mayor said Wilmington is a safer, cleaner and more welcoming City for residents, businesses and visitors alike. With the help of Council and citizens, Mayor Purzycki said crime will be reduced further, the City’s financial base will continue to solidify, City infrastructure will continue to be repaired and protected—including its water, sewer and parks systems—the public’s trust in government will increase, response time to citizen questions and problems will continue to improve and the delivery of programs and services will get better. 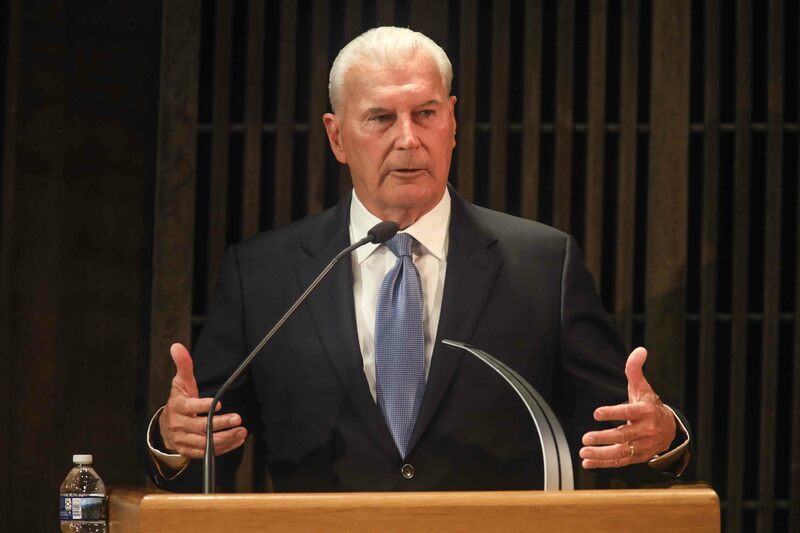 Mayor Purzycki said his first budget address in March of 2018 included a multiple-year financial stabilization plan that included a property tax increase to counter projected deficits. Because the Council adopted that budget and later a tax stabilization ordinance, he is now able to propose a zero property tax increase to support the Fiscal Year 2020 budget. Mayor Purzycki said barring any unexpected expenditures or emergencies, he is also projecting that no tax increase will be needed to support next fiscal year’s (FY 2021) budget. Regarding the proposed Water/Sewer/Stormwater budget which funds the City’s water utility, the Mayor said the City will adhere to its previously announced multiple year rate plan. That plan supports clean water production and sewer services, and provides for budget reserves for planned infrastructure maintenance and improvements as well as emergencies. Mayor Purzycki is proposing a 3.8% water rate increase for City customers (or a $2.21 monthly increase based on an average of 4,000 gallons of water usage) and freezing the current water rate for customers who reside in New Castle County. The Mayor said the decision to propose no increase for County customers is due to a long-standing disparity in service delivery charges for city and county customers. Mayor Purzycki said he is committed to developing a plan that reflects a more accurate cost of service rate system for City and County customers. numerous Administration accomplishments over the past two years including a dramatic drop in gun-related crime as well as improved community engagement by police officers; improvements to numerous parks including Father Tucker Park, Speakman Park, Canby Park, Rodney Square and Kosciuszko Park; improvements to City fire stations and to Wilmington’s only community center—the William “Hicks” Anderson Center; the HBCU College Fair, which has made college possible for more than 1,000 local high school students; important environmental advances, such as the South Wilmington Wetland Project and the EPA study of the former Diamond Salvage site in Northeast Wilmington. new program and service initiatives for City government, residents and businesses such as an OpenGov web portal that will be available within the next month so citizens can view additional information about City government; a new, one-stop 311 Call Center set to launch in April for a more rapid and consistent response to citizen inquiries and concerns; the OnBase online submission and review process for small and large development projects, which should launch within the next month or so; and the recent implementation of CityStat, an internal government management process that uses data to hold department directors and employees accountable for performance goals to achieve greater government efficiencies and improved delivery of services to citizens. a Citywide LED lighting project involving the installation of LED smart street lights in all neighborhoods, business districts and along gateway travel corridors. The new lighting project, which will help make Wilmington a brighter and smarter City, will start in the next few months and will be completed within two years. phase one of Wilmington’s first major Creative Placemaking Project—Urban Artists Exchange—is currently under construction at the former mounted police stables on Walnut Street. Eight individual art-making and teaching studios and one group space will harness the creativity, energy, and knowledge-sharing of local artists. The studios are scheduled to be available for occupation by artists later this summer. The public will be invited to view art-making in progress and to attend regularly-scheduled exhibits. The Urban Artists Exchange shares the one-acre Walnut Street property with the Urban Bike Project. a wise and prudent decision to borrow money to pay off an existing WHP loan of $3.4 million by restructuring the debt. The City’s debt position will remain exactly the same as before the restructuring. Wilmington will not have to use any current assets or cash to pay the loan as has been proposed, which would strain City budgets, require a reduction of services and programs and/or a tax increase. This Administration and Council did not create this problem, but like the many legacy conditions in City government today, it is up to the Administration and Council to solve it. the City’s decision to file for arbitration to force the NCC Government to pay its fair share of annual costs to the City for the operation of Wilmington’s Wastewater Treatment Facility. Mayor Purzycki said the proposed FY 2020 budget supports his Administration’s key goals of improving public safety, furthering neighborhood stabilization, supporting new employment opportunities, strengthening economic development and creating a cleaner, brighter and more attractive City. The Mayor said he also remains focused on Wilmington as a more livable and appealing center of commerce, arts, culture, finance, and technology. Mayor Purzycki also addressed his vision for Wilmington which he says is quite contrary to the picture others are attempting to portray regarding his Administration. Mayor Purzycki’s FY 2020 operating budget proposal totals $167.1 million, which is an increase of 3%, or $4.8 million, over the current FY 2019 operating budget. The Mayor said the proposed budget includes nearly $550,000 in funding for the City’s second annual Beautiful City Initiative which enables the City to contract with local non-profit agencies that will hire local citizens to clean City streets and neighborhoods. This funding also includes money to clean City parks and the major gateways into and out of Wilmington. The budget also includes $1.5 million to support a 2% cost-of-living-adjustment (COLA) salary increase for city employees. The Mayor said the budget will also transform the Office of Information Technologies (IT) from a budget unit within the Mayor’s Office to a stand-alone department to be known as the Department of Information Technologies; 22 of the 31 new full-time positions reflected in the new budget are due to the decision to move these positions out of the Mayor’s Office budget and into the new department budget unit. Other new positions in the proposed budget include two non-uniform positions and one School Resource Officer in the Police Department, two program coordinators in the Parks Department, a Zoning Enforcement Officer in Licenses & Inspections, a laborer position in Public Works, and two positions in Human Resources to support labor relations and classification and compensation. Based on a recommendation from Wilmington’s independent Water/Sewer Citizens Advisory Board (UCAB), the Mayor is proposing a 3.8% increase in water and sewer rates to support the proposed FY 2020 water/sewer/stormwater budget, which totals $77.9 million. This is an increase of 3.3%, or $2.5 million, over the current FY 2019 budget. The budget proposal would continue to support initiatives begun in recent years to make the City’s utility financially and environmentally sound. These initiatives include accelerating Wilmington’s Combined Sewer Overflow (CSO) mitigation effort and improvements to the City’s water filtration and water supply systems which exceed EPA standards. Mayor Purzycki said a financially and environmentally sound water and sewer utility will contribute to preserving the water supply for all of northern Delaware, especially in times of drought. The proposed budget does not include a water rate increase for the City’s water customers who live in New Castle County. Mayor Purzycki also presented two Ordinances tonight for City Council review. The first Ordinance will benefit citizens who are delinquent on their property tax or water/sewer/stormwater bills by reducing the monthly interest rate charged by the City for delinquent accounts. The other Ordinance will assist elderly, disabled citizens or caregivers so that once they receive a City property tax exemption, it will stay in place permanently instead of requiring them to re-apply every three years. Wilmington City Council will hold public hearings on the Mayor’s budget proposal during the month of April, and Council is expected to vote on a new budget for Fiscal Year 2020 at its May 16th meeting.